Hi friends, as an upcoming blogger I always keep my eyes and ears wide open as far as grabbing blog post topics are concerned and today got some good stuff to write. As I already mentioned in my earlier posts, I am serving in an Indian blue chip company and I am lucky to have a friendly boss with whom I have a good rapport. In spite of this, we hardly discuss personal matters because of our tight schedule but never forget to share our children’s achievements at least for a brief moment. Today in the evening when I was about to leave office, my boss called me inside his cabin and happily shown a news story about his son Mr. Mayank Rungta which was published on Bangalore edition of e-paper DNA (Daily news & analysis) on his PC. Like all Indian parents who are always willing to be part of their Children’s success he was also very happy and exited to share it with me. 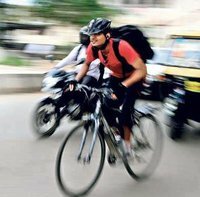 The title of the news story is “Make way for pedal pushers” and this about those determined people who use cycle to travel within the city of Bangalore. Instead of using his bike, Mayank pedals his cycle every day to go to his office which is about 11 kilometers from his residence. According to Mayank, riding a cycle is having many benefits both personal as well as environmental. He says, apart from saving money one can save valuable time, remain stress free, stay healthy and reduce our carbon foot prints by regular cycling. He is a proud member of Ride a cycle foundation, Bangalore and enjoys his association with this NGO group As I have mentioned in my earlier posts about carbon footprint reduction, need of the hour is to minimize fossil fuel burning. Voluntary change of life style is essential to achieve this and Mayank’s foot steps can be followed. Once upon a time Bangalore city was known for its greenery and cleaner environment but now day by day it is losing its originality mainly because of our inevitable modern activities and changeable life style. I want to discuss the benefits of cycling in detail so thinking of stopping here for the time being and continue hopefully tomorrow. Sir, nice one ,show how by doing small things we can gain big benefits . Thanks for sharing this beneficial post.